Alright, you can stop searching. You've just found the superman-strong work boots that will carry your rough and tough self through your extreme daily routine. Packed to the laces with outstanding construction and comfort features, the Chippewa Men's 25411 American ... (see full details) (see specifications) #CHP25411. Alright, you can stop searching. You've just found the superman-strong work boots that will carry your rough and tough self through your extreme daily routine. Packed to the laces with outstanding construction and comfort features, the Chippewa Men's 25411 American-Made 9 Inch Waterproof Boots deliver the power you crave. The black, oiled, and waterproof leather uppers will repel water in even the most intense conditions. Chip-A-Tex waterproof booties and Ruby Dri-Lex 2000 lining keep things comfy and liquid-free inside the men's boots by moving moisture through a multi-layer water-and sweat-wicking system that stops bacteria and odor from sharing space with your tootsies. The Texon 460 Waterproof cushioned orthotic insoles cushion your steps with padded comfort. Triple-ribbed steel shanks provide maximum arch support to help take the aches and pains out of your walk. The Vibram Tacoma yellow plug logger outsoles are designed to keep you steady on the most unstable surfaces. The angled edge on the lugs in the leather boots are a great edging resource. Goodyear leather storm Welt sole construction makes the waterproof boots extra sturdy. Goodyear Welted soles are fully repairable, a great advantage for men who work hard in their Chippewa boots like you do. The heavy duty waxed sta-tied Laces won't come loose during your day, which means less time tying and more time on the job. The USA-made boots also come with 4 Iron Rubber/6 Iron Robus Combination midsoles. Antique brass non-tarnishable hardware finish off the rugged design of this Chippewa footwear with a polished shine that won't dull. Your feet will find home in the Chippewa Men's 25411 Waterproof Logger American-Made Black Boots. End your search for men's footwear strength by putting a pair in your cart today. I bought these boots to cut wood and use all around, they are the most comfortable boot I have ever owned. I will not buy a Chinese or imported boots these being made in USA is a given. More people should buy made in USA and then our economy wouldn't be such a mess! this is by far,the best boot i have ever owned! the leather is soft,yet durable,i have people ask me ,where i got my boots,all the time, so,they are very good looking,not just durable as all get out!and MADE IN AMERICA!.you will not be sorry!! far better than the average logger! believe me! !and fit like a glove!!! They call me Kole the Pole cuz I do the climbing on the job. Very outstanding boot. Dig the free shipping. 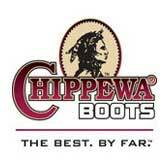 Chippewa Boots: Men's Waterproof 25411 USA-Made 9 Inch Leather Logger Boots is being added to your cart.